The Huntington Collection by Parker House presents English Traditional Style. It is made from select hardwoods and veneers in a multi-step chestnut finish with accent shading & highlights, hand distressing, and medium sheen top coat. The cabinets feature leaded glass door inserts with beveled diamond pattern. The Huntington Collection offers many options to fit perfectly in the desired spot or the entire room. It includes a multi-functional Entertainment Center, Home Office, & Bookcase Wall. Lighting on front beautifully accents literature and all display items. The Huntington X-pandable Console adjusts from 48" to 72" wide to allow for a custom fit with any TV size. The 4 Piece Executive Home Office Set includes Double Pedestal Executive Desk, one 32" Open Top Bookcase, and two 32" Glass Door Bookcases with Wine Center. The Double Pedestal Executive Desk features 2-doors, 4 adj. shelves, 3-concealed pullout shelves, 1-drop down drawer, and 6-drawers. It provides two pendaflex file drawers that accommodate standard or legal files. Drop-face pencil drawer accommodates keyboard or laptop. Three concealed pullout trays provide additional work surfaces. 4-port USB Hub is located on the desk. The 32" Open Top Bookcase features 3-adj. shelves, 2-panel doors, and 1-can light. The 32" Glass Door Bookcases with Wine Center features 2-glass doors, 2-stereo/wine shelves, 2-panel doors, and 1-can light each. The Wine Center accommodates a maximum 12" tall bottle. 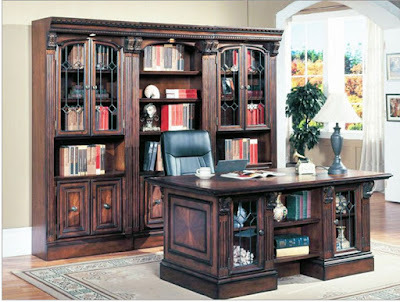 Check out other pieces from this elegant Huntington Collection to create a home office of your dreams!